With one gesture, Ethiopian runner Feyisa Lilesa seized the Olympics spotlight and educated the world. This is not usually what you hear after an Olympian shocks the running world by winning a silver medal in the marathon, but that is exactly what Feyisa Lilesa said about his future prospects in his homeland. Why would his country’s ruling party, the Ethiopian People’s Revolutionary Democratic Front (EPRDF), want to kill an Olympic hero? The answer is both ludicrous and as serious as a heart attack. Lilesa’s life is at risk because he raised his arms over his head and crossed his wrists as he broke through the finish line. Then, during his post-match presser, he lifted his arms and crossed them again. In Ethiopia, such a gesture at this moment in history is potentially a death warrant. Lilesa’s crossed arms are a symbol of defiance that demonstrators in Ethiopia perform at great personal risk. It is a statement of solidarity with the masses of Oromo and Amhara people who are currently being displaced from their homes and farms by Prime Minister Hailemariam Desalegn in order to expand Ethiopia’s capital city of Addis Ababa into Oromia. The government is insisting that, if Lilesa returns home, both he and his family will be safe. But Lilesa is openly pleading for asylum for his family in another country. Immediately, a crowdsourcing campaign to help with the relocation has now reached more than $120,000. Beyond money, the impact of his actions, both inside Ethiopia and among its immigrant communities, cannot be overstated. Among his compatriots, including those in the diaspora, Lilesa’s protest was welcomed with tears of joy. A hero was born out of relative obscurity…. I have no doubt that it will be remembered as a watershed moment in the history of Oromo people. Kids will be named after him. Revolutionary songs and poems will be written in his honor. For a people who have been silenced for so long this is likely to embolden and generate more momentum for the budding movement in Ethiopia. This moment is also compelling many to remember John Carlos, Tommie Smith, and their raised fists of freedom at the 1968 Olympics in Mexico City. The comparison to that hallowed moment is more than apt. Like Carlos and Smith, Lilesa did not make his gesture in a vacuum but as something connected to a much broader movement. Just as thousands of people in the United States were raising their fists in 1968, thousands in Ethiopia are crossing their arms above their heads in revolt. Like Carlos and Smith, Lilesa knew he was violating the IOC’s charter by bringing politics to the field of play. And just as Carlos and Smith acted with full awareness that they were risking their lives, making such a gesture in the era of COINTELPRO, Lilesa knew that to take such a step carries a similar risk. And yet, still they raised their arms because doing nothing would have been unbearable. They used the Olympic spotlight to pull back the curtain on their country because evil and violence flourishes in shadows. 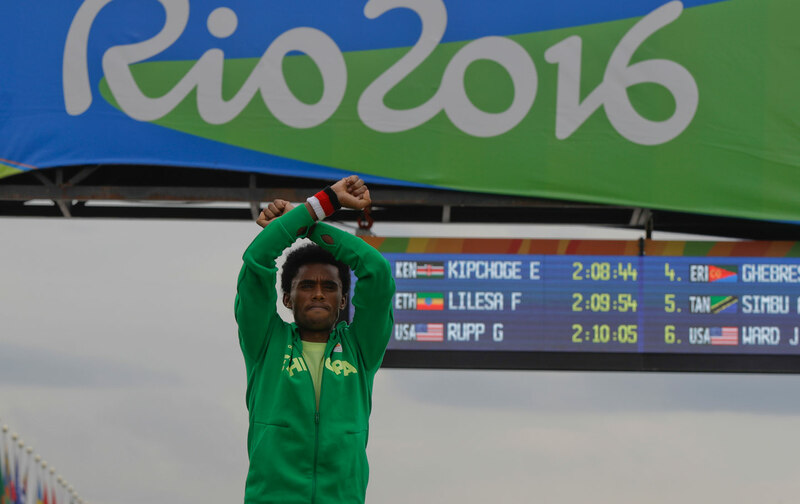 Although the authoritarian Ethiopian government has attempted to forcibly crush the protests and rules the country through the politics of fear, Lilesa’s gesture embodies strength, hope, courage, solidarity, and defiance, while poignantly illustrating the broader socio-political significance of sport. That “significance of sport” has been demonstrated at the Olympics before and will surely be on display again in the future. Lilesa made sports significant because, with one gesture, he educated the world on an under-publicized struggle and fueled a resistance. The Oromo have made clear that they will not be the collateral damage of neoliberalism. Now the rest of the world, in addition to the government in Addis Ababa—if nothing else—has gotten the message.